Trade – a rather nebulous word has been used frequently in the last few weeks’ blog posts. The U.S. Navy was established to protect trade. The Barbary Pirates were disrupting trade. So…what’s so important about “trade”? Where did trade happen? What did they trade for? 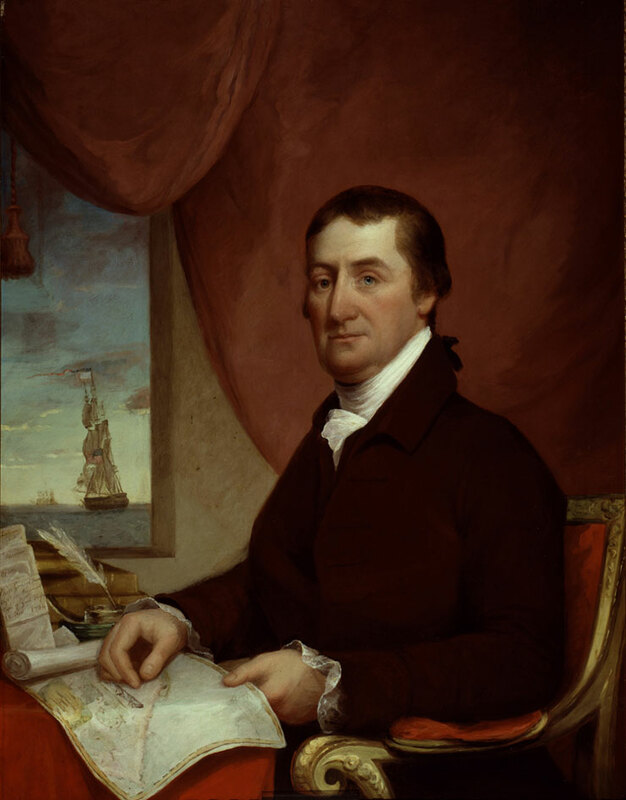 Today’s article addresses some pretty amazing facts about early 19th Century maritime trade and its role in the United States’ international, interstate, investments, and infrastructure goals and opportunities. We can’t really do the topic justice in a short article, but we’ll give an overview. The international reach of American trade during the early 19th Century is easy to forget and it’s generally not emphasized in “regular” history textbooks. Trade with Europe and the triangular trade routes dated back to Colonial Days. American merchant ships ventured into the Pacific, around the Cape of Good Hope, along the coasts of India and Asia, and among the South Pacific Islands. Profits in tea, coffee, spices, and other Far East goods were high for the ship owners and crews. What did America offer to the world markets? Primary exports included cotton, tobacco, salted meat (usually fish), furs, rice, and tar. Winds, currents, and seasonal weather patterns created the trade routes and seasons; the growing seasons of the destination’s products also played a role. (For example: you wouldn’t want to arrive when the coffee beans weren’t ready and have to wait several months. That’s not how you’ll make money with a merchant ship!) In fact, the clipper ship was designed to sail incredibly fast with the purpose of arriving in a foreign port ahead of competitors to get the best deals. American merchant ships fostered economic growth in the United States and in the countries they traded with. In distant lands, merchant captains and crews “represented” the United States and sometimes carried helped negotiate alliances. They helped form port cities and brought western ideas and technology to Asian and South Pacific countries. Regular ship lines were established between American and Europe and the invention of sea-worthy steamships provided a regular means of transportation. Prior to the advent of railroads, ships – usually schooners – were the primary transportation method for raw and manufactured materials between states. The Southern States, deeply rooted in their agricultural economy and society, exported cotton, rice, and tobacco to the Northern States. Manufactured products like fabrics, shoes, metal work, and a host of other necessary and luxury items were imported to the Southern States, usually through the port cities. It wasn’t all perfect through. Trade tariffs caused congressional debate and outrage in the South, and, for some, it would be a leading factor toward the Civil War. New England ship owners were the “financial barons” of their day. They built economic empires investing in ships and cargoes. If the voyages were successful, they made huge profits. Huge warehouses held the goods brought from foreign ports and sold them to American merchants. While situations tended to differ based on the owner’s wishes, the merchant ship officers and crews were often well-paid and could sometimes make investments of their own in the cargoes and trade. Take away the ability for American ships to sail in the 19th Century and the U.S. national economy dissolved into shambles. This situation is illustrated during Jefferson’s embargoes which, though meant to coerce Britain and France, hurt American maritime trade. Those ships crisscrossing the globe did more than import and export. They provided the livelihood for a whole community – perhaps the whole nation. Think of it this way. If the American ships did not sail…shipbuilders had no work, captains and sailors lost their jobs, and ship owners went broke, the chandlery shops closed, the ropemakers went broke, etc. etc. Now wait, it goes farther. Importation ceases, so the shopkeepers are in trouble. Jobs are lost, people don’t have money to spend. Economic trouble. That’s a negative example – so think of it positively. 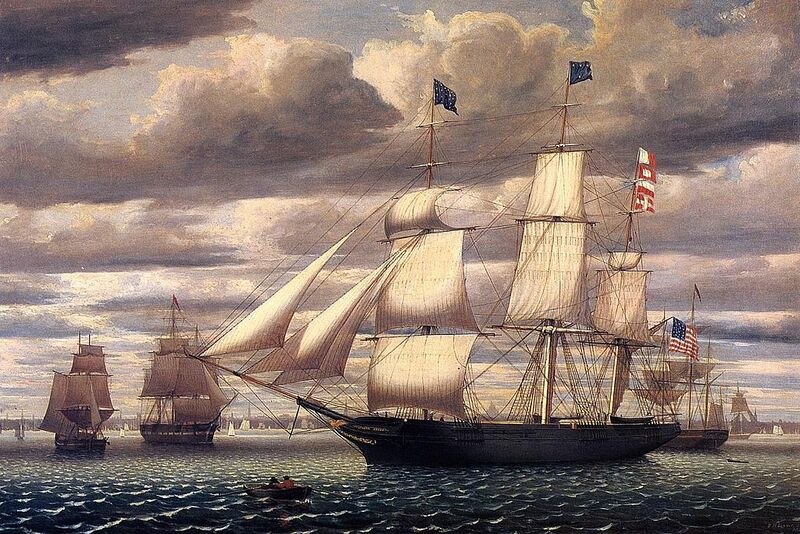 The American maritime merchants played a major role in keeping the U.S. economy afloat, expanding, and flourishing. The time period between 1814 and 1861 is generally called the Golden Age of American Sailing. It’s an era when America competed or dominated certain world markets, opened countries for diplomacy, and basically build a trade empire through business relations. Faster ships, daring captains, and wealthy ship owners contributed to the growth and stability of communication and economy.